Variations in the aggregate and in the cement are used to create numerous colors and shades which can be arranged in intricate patterns or randomly placed for a mottled appearance. They become a design element and represent a significant upgrade from traditional poured concrete slabs. ​Unfortunately many of these surfaces are being ruined by improper cleaning and sealing techniques. If left to weather naturally, these stones will slowly erode and lighten from U.V. exposure, and can be stained by rust, fertilizer, oil, and other contaminants. In order to prevent this deterioration many homeowners elect to have their driveways and patios sealed. They have good intentions but are lacking the knowledge to make a wise choice. ​WILL THE SURFACE BE SLIPPERY? No. 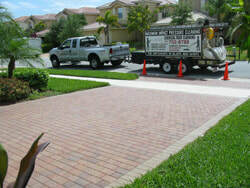 When applied properly and back-rolled to eliminate puddling, the sealer will maintain the natural texture of the surface. 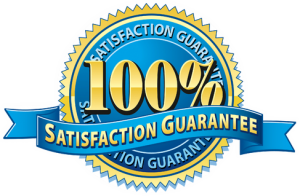 It is only when excessive amounts of sealer or multiple coats are allowed to dry to a mirror-like glossy finish that the surface will become slippery. ​WHY DOES MY DRIVEWAY KEEP TURNING WHITE? ​CAN I CHANGE THE COLOR OF MY PAVERS OR CONCRETE? ​Yes. 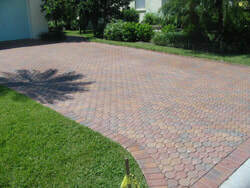 Not only can we seal your pavers or concrete, we can also stain it in any color you might want with a stain-sealer that offers superior adhesion, stain resistance, and hot-tire inhibitors.